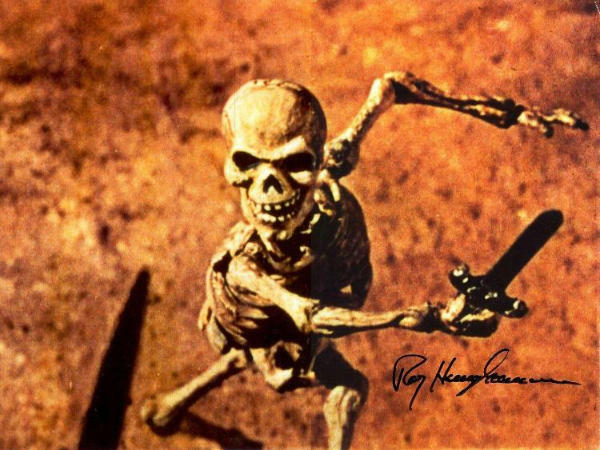 Ray Harryhausen Studio scale Jason \'Skeleton\' ? Discussion in 'Studio Scale Models' started by Jimbo890, Dec 16, 2003. I was wondering it there was a replica "stop motion" version of the skeletons used in the Ray Harryhausen film Jason and the Argonauts? I've seen some 4 inch solid resin sets, but nothing articulated, and nothing to scale. Thanks inadvance for any info. I've been into stop motion for a long time,and you can get some great pointers at that web page&everyone is super cool.I am still learning&have a long way to go before I can confidently say I know what I'm doing. For starters...if it were me I would buy a model kit,say the visible man kit from Skill Craft,or an old one from Pyro.They stand about 15"(I have one I am currently using&the detail is very good)both are virtually the same kits.With some very small modifications(mainly with a dremel tool&some resculpting of the skull)running some soft annealed aluminum wire throughout the arms and legs&epoxying together.You may have to cast some of the other joints like the ankles,feet,wrists,hands&spinal colum because they are solid parts in the kit.A simple wire armature will work perfectly for this&it will be posable.I don't think you want to get into the more complicated&expennsive ball/socket&hinge jointed armatures. I'm not certain what scale Ray Harryhousen made the skelleton puppets.If the Skill Craft kit is too small,maybe try looking at some of the stuff Edmund Scientific has(do a google search).I seem to remember them having larger models of the human skelleton from a 1:1 scale to 18-30" tall if memory seves,but that was a long time ago...so you never know if it is still available.Anyway,I hope this pushes you in the right direction. If I recall correctly, Ray H. did these skeletons in 1/6 or 1/8 scale. So, that would be about 8-12" in height. Thanks for the "Visable Man" idea. But I was really interested in a replica of his Skeleton. Although not anatomically correct, still a cool filming miniature. I have seen "Talos" and other 1/6 scale vinyl figures, but none of the Thin-Skinnies. Oh well, it is just a latex rib but it is an ORIGINAL . Hey Jimbo....you have your scales in reverse.At least it seems that way(I appologize if I am wrong).1/6 scale will put the skelleton at around 14" tall,1/8 will make it around 16" or so,1/12 will make it around 10-12"&1/4 scale will put it around 18".I have the Cinefex issue of Ray Haryhousen(an old one) and Ray built many of his puppets with the "build up method".This was done with liquid latex,cotton&soft polyurethane couch foam in some cases.Basically,you are sculpting with it.He also cast his puppets with a soft,polemerized urethane rubber and ran some with foam latex.Foam latex is "the work horse" of the stop motion industry and is still employed today. However,many other people veer off and use the soft polyurethane rubber,or silicone.The products have changed&improved from 25-35 yrs. ago.Neither of them possess the properties that foam latex has(but close).However,they withstand the test of time where as a puppet made of latex will decay shortly.Latex rubber is very corrosive on metal,which is why the armatures are made of stainless steel,or aluminum. Dragon Silicone is a great casting medium&has a shore A hardness of 10(very soft&pliable),has spectacular stretch/elongation,pigmentiing/tinting&memory properties.It is made by Smooth On,and the advertisements are sceen in Amazing Figure Modeler&the like.Smooth On has a web page as well(cant think of it off the top of my head,so try a google search). I think you could sculpt(or re-sculpt on a kit) the skelleton if you want.Some parts will have to be sculpted&cast seperately like the jaw/head,ribs,hands&feet possibly&adheared on later.The basic armature could be of aluminum wire,unless you intend on making stop motion movies with it. Thaks for the info. I thought the Skeletons were made of Cotton dipped in resin and applied to the armatrue. Oh well. And as for the scale, Me thinks its 1/6 scale [the same as the 11 3/4" vintage GIjOE figures] or fairly close. There is a featurette on the Jason and The Argnauts DVD, and Ray is playing with one of the skeletons. Thats where I got the scale from. Its just an eyeball guess. Jason&The Argonauts was made back in the 1950's if I am not mistaken.The main puppet building materials back then was liquid latex&cotton.I think they used really soft tire rubber(in it's liquid state).thats what I think King Kong was made of in the 1930's and of couse they used the "build up method" extennsively.Polyester resins were around the early 1950's(because of the Corvette of course).Maybe he did use some of it? Honestly I am not 100% certain.It may explain why the puppets are still around,but they may have been preserved very well.Like I mentioned,latex is very corrosive on metal.The amonia in it attacks&rusts steel which is why the really old armatures that were made way back in the 50's,40's,30's and beyond are rusted away&destroyed the puppet. Thats why I think that if you want to make something like this,cating with a soft polemerized Urethane with a Shre A hardness of at least 10(you will need to add the additional component to achieve this) will work really well.Painting it will be a bit of a pain,you have to get special urethane paints,or mix a little of the same stuff you cast with at a time with oil paints to achieve the paint/color. I think the Dragon Silicone made by Smooth on is best,it already cures soft like that,is translucent so it takes to tinting&pigmenting very well.Painting is'nt too much of a problem,you can buy clear silicone caulking at a hardware store,mix it with oil paint(not too much)and thin with Naptha solvent(very toxic,be careful).Anyway,thats my tid bit of knowledge,I hope it helps . Jason and the Argonauts was made in 1963. I just watch "Jason" and the special feature and yes, the skeletons were made of cotton dipped in liquid latex. Hmmmmm. Ray had one of the Skeletons, and it hard to tell scale, but the figure looks to bee about 10 - 12 " In height. I just assisted to a small homage in Madrid, Spain to Ray Harryhausen here in Madrid, where I had the pleasure of meeting him, a pleasure not just because of meeting an idol since my childhood but because he's such a nice person to talk with. He brought one of the Jason skeletons and it was much smaller than I had imagined it, between 9 to 10 inches. It was very funny because he brought it in a small black coffin made of cardboard. He said that in most of the models the latex was decaying (he has made broze cast of most of them to save the sculture from being forever lost). In the particular case of the skeletons the models were holding very well because of being made in cotton soked in latex, in fact the skeletons were sculpted right over the armature "it's very hard to cast a skeleton over another (metal) skeleton! So I had to suplt the figure directly over the metal armature" Ray said. http://www.monstersinmotion.com/books/harrybook.html I bought it and it is the best and definitive to date! 72 inches divided by 4 equals 18 inches at 1/4 scale.